Preheat oven to 1800C. Spray an oven tray with nonstick cooking spray. • Place chicken and vegetables and mix in oven tray; top with butter and pour oil over to coat well. • Roast for 30 – 40 minutes until chicken and veggies are tender. 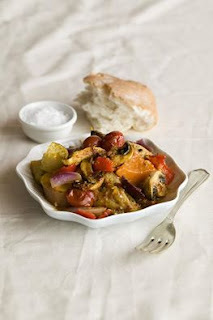 • In a bowl, mix together all remaining ingredients and toss with chicken and vegetables. • Return tray to oven and bake for a further 10 – 15 minutes until chicken and vegetables are browned and cooked through completely.